Brooklyn is the place where innovative meets design, creating spaces that are so unique. Homecoming in the Greenpoint neighborhood of Brooklyn is just the place to see that come alive. For starters it's abstract name makes you wonder what is even inside. 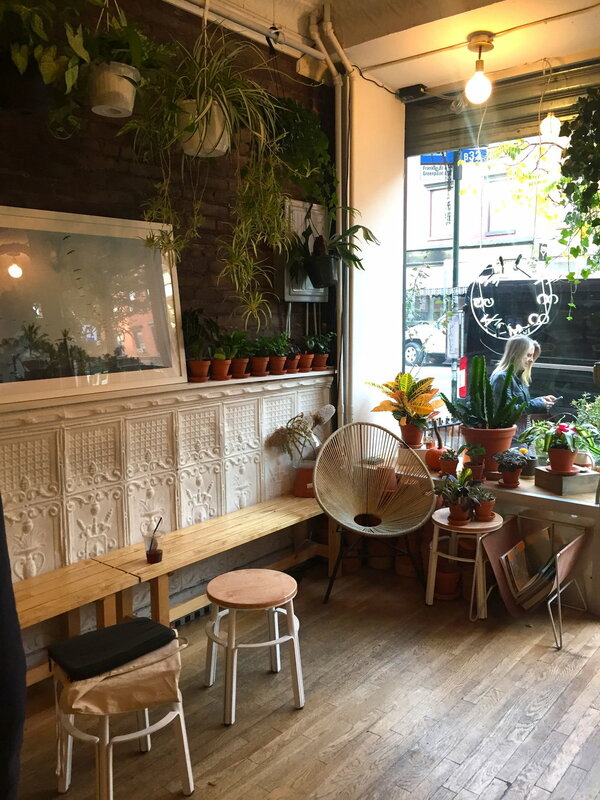 It's a coffee shop up front + the back of the store is filled with gifts + plants that brings life into the space. While you wait for your coffee to be brewed it's the perfect opportunity for you to find that perfect cactus you have been looking for to spice up your own space. The exposed brick + white walls in the trendy little shop allow for the plants + succulents to really take center stage while not competing with one another. The café is just as simple, with white walls + white subway tile, the seating area has just the right amount of design, a white tile wainscot with a wood bench in front + a painted dark brick wall above. Homecoming is a great little shop + coffee café bringing my favorite things together all under one roof. Be sure to stop in + see for yourself while visiting Greenpoint.